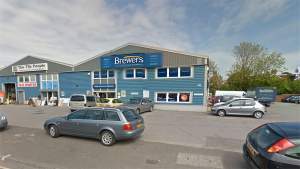 At Brewers Decorator Centre in Haywards Heath, we’re a lively, good-humoured group with a high level of technical knowledge. Our retail customers and tradespeople alike come here for the reassurance of our expertise and our wide range of trade and designer paints, wallcoverings and various decorating sundries, tools and access equipment. We also have protective coatings expertise, making us the best source of specialists paints in this part of Sussex. If you’d like the benefit of our advice on a particularly tricky job, we’re happy to do site visits and we offer free delivery within a five-mile radius. Our store is on the north side of town, towards Lindfield. We’re a couple of minutes’ drive from the B2112 Portsmouth Lane and the B2028 Mill Green Road and Haywards Heath train station. Head for Queens Road, take Bridge Road and we’re next door to The Tile People. There’s lots of parking the store is wheelchair-accessible.